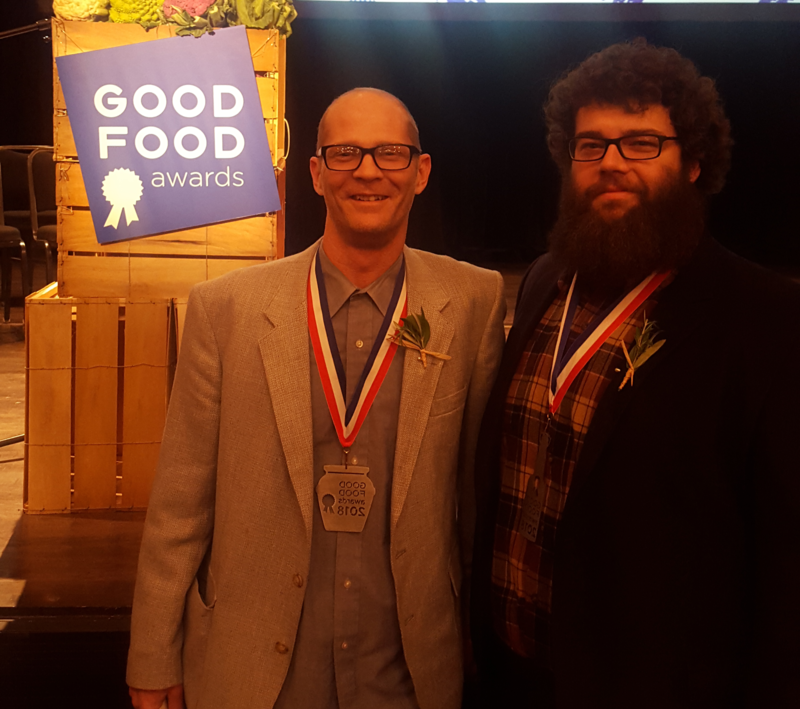 Fullsteam wins three Good Food Awards! It's official! It's the first time EVER a brewery has ever won three Good Food Awards in a single year! Fullsteam's three Good Food Award-winning beers -- all from our “Farm’s Edge” series -- embody our collaborative and holistic approach to business, our “plow to pint” ethos, and the Good Food Awards’ exacting standards for sustainability and social good. Each beer had to pass the judge's blind tasting and the Good Food Awards' social and environmental vetting process. To receive three Good Food medals -- in company with such lauded breweries as Almanac and Perennial -- is truly validating. Not only for the beers themselves, but for our commitment to fair wages, environmental stewardship, and the Southern Beer Economy. Fullsteam is, to date, the only North Carolina brewery to ever win Good Food Award, taking home accolades in 2013 for First Frost, a winter ale brewed with foraged persimmons, and in 2016, for the brandy-barrel version of First Frost. Farm’s Edge: Alexis, a blackberry Brett saison brewed in collaboration with Hillsborough, N.C.-based Seal The Seasons, using local grain, Fullsteam’s house mixed culture, and blackberries from Lineberger's Maple Springs Farm in Dallas, N.C..
Farm’s Edge: Brumley Forest, a Baltic Porter brewed in collaboration with the Triangle Land Conservancy, featuring foraged black walnuts and hickory nuts collected on TLC’s new protected and public land, Brumley Forest. Farm’s Edge: Dinnsen’s Orchard, named in honor of Wynn Dinnsen, North Carolina's leading proponent of the native paw paw and the source for nearly all the paw paw fruit in this sweet, tropical Belgian-style Tripel. Brian Mandeville (our head brewer) accepted the three medals at a gala event last night at the San Francisco War Memorial & Performing Arts Center in San Francisco. Joining him (in person or in spirit) were nearly 200 companies that care deeply about the issues we're passionate about. One of those other companies deserves a special shout-out: Nena’s Provisions, a sauce company owned by Fullsteam’s Director of Food Operations, Kyle Lee McKnight, which won for its delicious and addictive Dusty Foothills table sauce. On Saturday, January 27, 2018 from 2 to 5 p.m., we're hosting over a dozen North Carolina Good Food Award winners and finalists, past and present, at a mini-marketplace. The free event features a wide range of products for the public to sample and purchase. Come celebrate the North Carolina Good Food community! WANT TO TRY THESE BEERS? Farm's Edge: Brumley Forest is currently on tap and available in 22oz bombers. 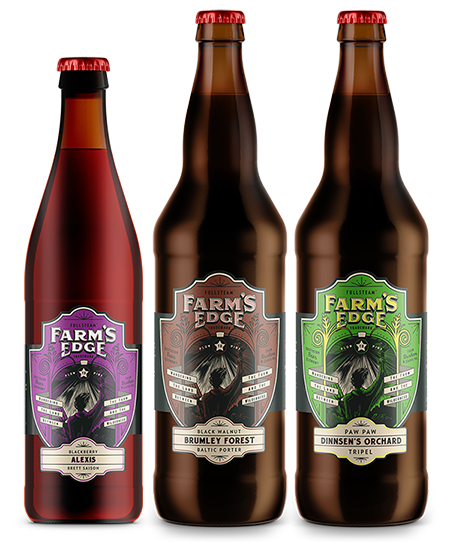 We also have bombers of Farm's Edge: Dinnsen's Orchard for sale at the tavern, and we'll put the beer back on tap at the Good Food mini-market (we set aside a little bit for the big news). Farm's Edge: Alexis is all gone. (Sorry about that, Jon.) We're hopeful that we can brew the beer again. In the meantime, we're planning other collaborations with our friends at Seal the Seasons. Here's the official press release (PDF), complete with contact information.